Average credit card rates across categories. Business credit card rates spike. Average credit card rates offered to small-business owners jumped a quarter of a percentage point in the last two weeks, while rates offered to consumers on new accounts rose slightly, according to the latest rates survey by IndexCreditCards.com. Credit card rates offered to business owners for non-reward credit cards increased to 14.72 percent from 14.47 percent, and rates for reward business credit cards broke the 16 percent barrier for the first time, rising to 16.03 percent from 15.74 percent. The average rate offered to consumers increased by a sliver to 16.79 percent from 16.75 percent. Consumer reward credit card rates rose to 17.46 percent from 17.43 percent, and consumer non-reward credit card rates went up to 15.22 percent from 15.19 percent. Reward credit card rates are generally higher than non-reward cards; the extra revenue from higher finance charges pays for the cost of the reward programs, such as cash back, airline miles and free gas. The student credit card rate, meanwhile, remained the same at 16.23 percent. Credit card rate increases are bad news in a tight lending market when many small business owners have to rely on credit cards to buy supplies and equipment and to fill cash flow gaps. Business credit cards are not legally subject to the consumer protections that have gone into effect under the Credit CARD Act, such as the prohibition on interest rate hikes on existing balances and rate hikes on new purchases during the first year of an account. Some card issuers have voluntarily extended some of the protections to business customers, but they're under no obligation to continue them, and they don't necessarily extend all the protections. Compared to rates six months ago, the average consumer credit card rate is actually down -- 16.79 percent versus 16.8 percent -- while average business credit card rates are well above the earlier levels, particularly for accounts that don't offer rewards. Non-reward business credit card rates averaged 13.94 percent six months ago, versus today's 14.72 percent, and business reward card rates averaged 15.74 percent, versus today's 16.03 percent. One year ago, meanwhile business credit card rates for both reward and non-reward cards were under 14 percent. Although the Credit CARD Act restricts interest rate increases on existing accounts, it does not limit how much issuers can charge on new credit card accounts. It appears that issuers have taken a breather from ratcheting up rates on consumer credit cards. After rising steadily for months before the bulk of new federal credit card regulations went into effect in February this year, they've stabilized, bouncing up and down between 16.74 percent and 16.85 percent in the last six months. In its calculation of average rates, IndexCreditCards.com takes into account all the rate tiers charged for each credit card included in the survey. Issuers often charge two to four rates for a single card, depending on applicants' credit ratings. Those with the best credit scores get offered the lowest rates, and those with the lowest credit scores are offered the highest rates. Consumers with excellent credit ratings are offered an average rate of 11.25 percent for non-reward cards, versus 15.22 percent for the overall market, and 13.76 percent for reward credit cards, versus 17.46 percent for the overall market. 0 Responses to "Average credit card rates across categories. 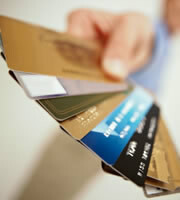 Business credit card rates spike."